Gerda Steiner Designs, LLC: Flamingo! Hey there! Today, I'm sharing a card using a new set in the Gerda Steiner Designs store, Upside Down Flamingo. This is a smaller set, but it has one large image and two large sentiments. This flamingo is so silly and it's peeking between the legs. I wanted to do something simple with this card since it's a large image. I colored the flamingo in typical pink and yellow colors. I wanted to play off these colors so I used a strip of Bristol Smooth paper with distress inks to create a colorful strip. I love the sentiment being stamped on this since it's pretty bold. I love how the sentiment pops. The card is super simple, but I love how it's a balance amount of the white card panel with pops of color. 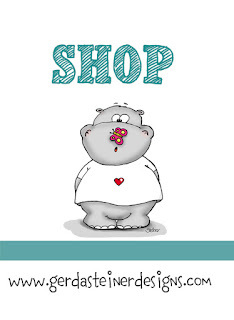 I hope you enjoyed today's card and the new stamp sets that have come to the shop this week. Have a great day and I'll see you next time with another card! Oh NEED this stamp!! I LOVE that sentiment and always say this to the kids I work with! !